Take a trip back in time this weekend to the days of pharaohs, ancient empires and legendary queens with the Ancient World Treasure Draw at Grosvenor Casino. 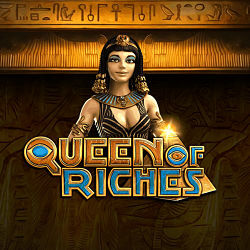 With this historically-themed prize draw giveaway you have the chance to win a share of £10K in bonus funds simply by spinning slots based on Cleopatra, Roman gods, ancient Aztecs and more. 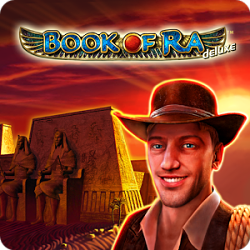 Keep on reading to find out how you can enjoy this intrepid adventure and bag your bonus prize. A total of 753 winners will shared the incredible £10,000 prize pool in Grosvenor’s Ancient World Treasure Draw, with the top winner being treated to a whopping £1,000. As soon as you’ve met these qualifying stakes, you’ll be entered into the £10K prize draw. After this, every additional £20 you stake on any of these games will earn you another prize draw entry. 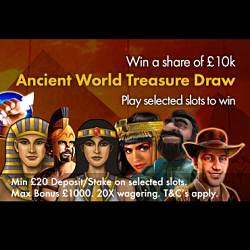 All registered members of Grosvenor Casino are welcome to take part in the Ancient Slots £10K Prize Draw. Only real money wagered on the qualifying slots between the 24th and 30th of April will count towards prize draw entries. The winners will be selected at random within 48 hours of the promotional period coming to an end. All bonus funds won in this offer will be subject to a 20X wagering requirement which must be played through before winnings can be withdrawn.